Diil is not considered to be a mobile service operator because it has no real shops. A virtual shop inside EMT’s real shop. You could see the 3D view to Diil’s shop through Google Cardboard. The virtual shop contained everything a proper shop needs. The offers shown in the virtual shop could be changed over the internet which made changing offers in the virtual shop much cheaper than in the real shops. 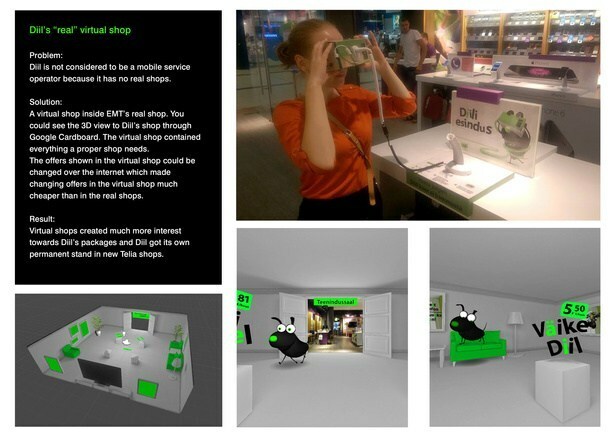 Virtual shops created much more interest towards Diil’s packages and Diil got its own permanent stand in new Telia shops.